This page is a translated version of the page Corpo and the translation is 100% complete. 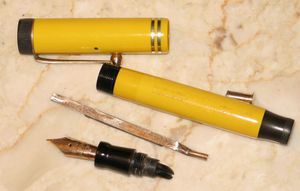 A Duofold disassembled with the pen barrel in the center. The barrel, or body is usually the largest part of a fountain pen. In modern cartridge filled pens it has practically no other role than to provide support for the use of the pen and cover the cartridge, but initially, when the pens were loaded with droppers, it was used directly as an ink tank. This role is still played today with some filling systems such as the piston filler or plunger filler, in which case it is often equipped with transparent parts (windows or entire sections) to allow the display of the ink level. Example of inscription on the body of a Balance. Even when the ink is not contained directly in the barrel, or in a part of it, but in a separate tank, as with all loading systems that use a rubber bag, the body still plays the role of container both for the latter and for the filling mechanism itself. Moreover, especially in the productions up to the '40s, it was typical to find the engravings of the brand and of the name of the producer (as well as of the possible patents of the pen). Initially, also for the greater facility of working, it was realized in cylindrical form with flat ends (the so-called flat top) but following the evolution of the stylistic tendencies it has been passed to more tapered forms (with the birth of the so-called streamlined style). Moreover, with the evolution of stylistic trends from the ordinary round section, we have moved to multifaceted, triangular, square, octagonal, dodecagonal forms, etc. In addition to differentiating itself for the various forms adopted by the producers, the barrel has also undergone the evolution in the use of the materials used in the construction of the fountain pens, of which it constitutes the largest component. At the dawn of the fountain pens it was mainly made of hard rubber like the rest of the pen, a material that guaranteed, having to serve as an ink tank, the necessary chemical resistance. With the development of the technology all the other materials have been used then, starting from the metal (the first were probably the Wahl Metal Pen), the first artificial resins such as bakelite, galalith and celluloid, to pass in the '40s to the most common plastic resins still in use today. This page was last edited on 2 April 2019, at 11:02.